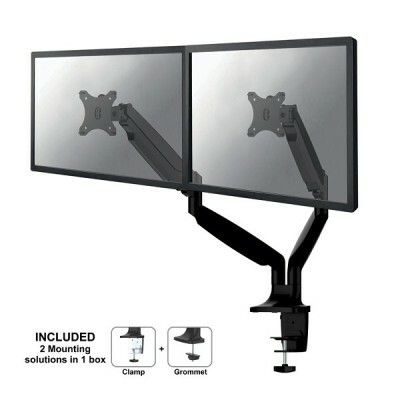 Newstar Full Motion Dual Desk Mount (clamp & grommet) for two 10-32" Monitor Screens, Height Adjustable (gas spring) - Black The NM-D750DBLACK is a tilt-, swivel and rotatable desk mount for 2 flat screens up to 32" (82 cm). 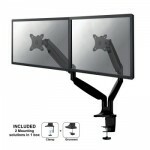 The NewStar desk mount, model NM-D750DBLACK is a tilt-, swivel and rotatable desk mount for 2 flat screens up to 32â€. This mount is a great choice for space saving placement on desks using a desk clamp or grommet mount. NewStar NM-D750DBLACK has three pivot points and is suitable for screens up to 32" (82 cm). The weight capacity of this product is 9 kg each screen. The desk mount is suitable for screens that meet VESA hole pattern 75x75 or 100x100mm. Different hole patterns can be covered using NewStar VESA adapter plates.